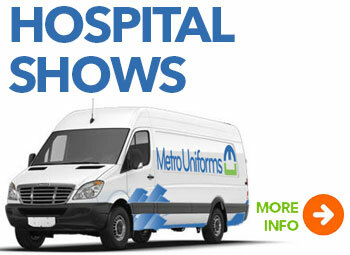 Along with being an online retailer, Metro Uniforms also provides on-site special services to local DFW are hospitals and healthcare facilities. Let us come to your facility and provide you and your employees the convenience of easy on-site shopping for new uniforms, shoes and medical equipment. We bring the online to you! We provide special discount rates on items that are purchased at the on-site showcase event. These are discounts that even our online customers do not receive! On-site showcases also provide the added benefit of being able to see and try on the scrubs prior to purchasing to ensure the best fit and satisfaction. We can work with your facility's accounting department to set up for payroll deduction plans, providing flexible payment options for your employees. Cash, checks, and credit cards are also accepted at the events. Nothing beats the convenience of being able to shop for new uniforms while you work. Save your employees time while providing a great service. 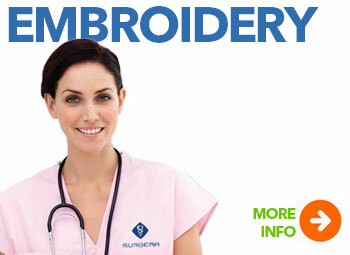 We provide embroidery services for scrubs, lab coats, and polo shirts at a competetive price! Embroidery will give your company a professional and uniform look. Have your company's logo, or your own custom logo embroidered on your scrubs. Have your name and title embroidered on your scrubs or lab coats for a professional look.